High school volleyball season is kind of a crazy time of year for me. I shoot pictures for varsity since my niece is on that team. This year I also volunteered to shoot JV. 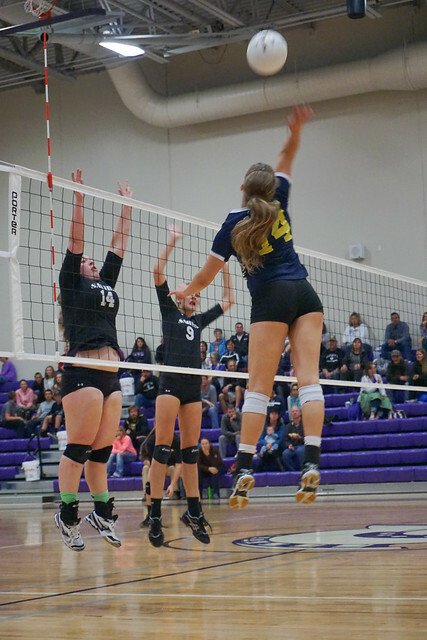 Since they typically play twice a week that’s a minimum of two sets per game for JV and a minimum of three sets per game for Varsity, for a total of 10 sets every week. It can be more if there are more sets played in a match. But that hasn’t usually happened. On a good note, I’m getting better at shooting fewer pictures, culling them faster, deleting extras off my computer, thereby saving space, and doing what little post processing needs to happen quicker. Then it’s off to a Shutterfly Share site with them. My niece proves you don’t have to be tall to get air. Last night’s dinner following the Salida game ended up being Sonic, which would normally be fine. But this was a pretty sorry choice. The Dr. Pepper was pale and then they added an absurd amount of cherry flavor to it, rendering it completely undrinkable. Got it replaced with a Cherry Limeade, which was good. The BBQ boneless wings had a spicier sauce on them so I didn’t want them, either. My niece enjoyed them, though. The cheesy tots were funky. I think the tots were stale. I normally love their cheesy tots with ketchup and salt. Even that was inadequate to make them good. Then to top it off, my body decided that really wasn’t acceptable food, so I wasn’t feeling too great this morning. Fortunately, I seem to be okay now. Chance are that I won’t eat at that Sonic if I happen to be in Salida ever again. 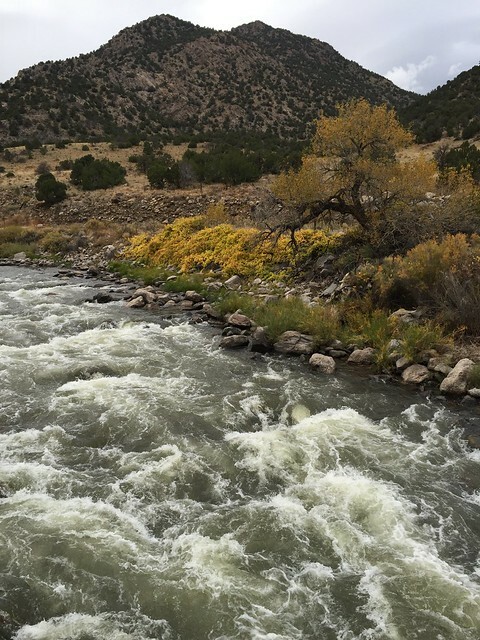 Along the way to Salida, we stopped at this lovely place along the Arkansas River. I’m supposed to be entering work orders for my husband’s business right now. And working on tax stuff. And I will. Shortly. I still want to get back to some sort of pseudo-regular blogging. I think about blog posts and images a lot, but it just isn’t getting out of my head and onto the computer. I may just do some random, here’s-what’s-going-on-type posts, rather than trying to come up with some particular topic. For now anyway. I was thinking the other day that I need to have a better different perspective on my “job.” It IS my job to handle messages for John’s business (mobile RV service), schedule appointments that I can, enter his work orders, and take care of taxes (except the part our accountant does). But I sort of just try and fit it in somewhere and then it doesn’t happen. Since it really is my “job,” I need to treat it as such. That way I won’t get to the end of the quarter and be in a panic, entering 90 days’ worth of work. Once a week would be so simple and keep us up to date. Every Monday I need to enter the previous week’s work. Period. Just do it. Be all Nike about it. If I had some, I’d wear them. Whatever happened to the paperless society we were supposed to be creating with all the technology and computers and such? Seems to me we have more paper than ever. It doth overwhelm. I think it’s worse than weeds if you don’t deal with it on a daily basis and have a good system for managing it. I kind of have a system, but I’m dreadful at using it well. Thus, the papers pile ever higher, threatening to drown me. Or at least make me crazy…er.